Sleeve notes in English, French and Finnish. Song lyrics in original languages and in English translation. Lines are beautifully sustained. Her way with words is subtle and crystal clear (...). As always, she aims to let the music speak for itself (...). She brings telling insights to the Duparc songs (...). The playing is pristine and superbly detailed. Soprano Soile Isokoski is singing orchestral songs by three different French composers in her new recording. The recording includes two major works in the French song repertoire - Ernest Chausson's Poème de l'amour et de la mer and Hector Berlioz's Nuits d'été. The disc ends with three finely-crafted miniature songs by Henri Duparc, which are no less of artistic value. Soile Isokoski is recognized as one of the world's finest lyric sopranos and regularly appears on the most renowned stages. Isokoski made her début at the Finnish National Opera as Mimi in Puccini's La Bohème and has since delighted audiences and critics alike at opera houses in Vienna, Berlin, Munich, Hamburg, London, Milan, Paris, and New York, and at the festivals of Salzburg, Savonlinna, Ravinia, Tanglewood, Edinburgh, and Orange. Soile Isokoski has worked with numerous distinguished conductors. Isokoski has an extensive concert repertoire, and she regularly gives recitals in the most renowned stages. In this recording Soile Isokoski is accompanied by the Helsinki Philharmonic Orchestra together with its celebrated Chief Conductor John Storgårds. 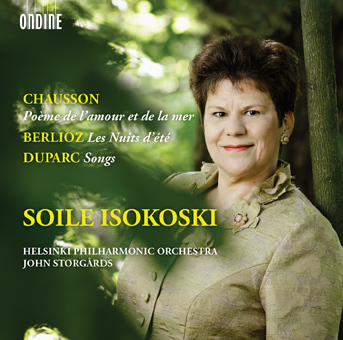 Soile Isokoski has a wide catalogue of recording for Ondine. Isokoski's award-winning recordings for Ondine include Sibelius's Luonnotar and other orchestral songs by Jean Sibelius, with the Helsinki Philharmonic Orchestra under Leif Segerstam (2007 BBC Music Magazine Award ‘Disc of the Year' and MIDEM Classical Award), and Four Last Songs and other orchestral songs by Richard Strauss, with the Berlin Radio Symphony Orchestra under Marek Janowski (2002 Gramophone Award).